*Shellie Zimmerman told the “Today” show’s Matt Lauer that she’s unsure of what exactly happened when her estranged husband, George Zimmerman encountered an unarmed Trayvon Martin on the night of February 26, 2012. She’s also unsure it was self-defense. 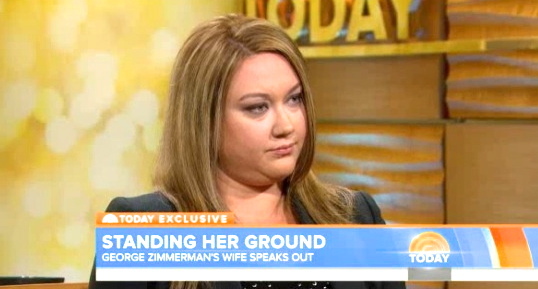 Shellie Zimmerman says she doesn’t believe her husband profiled Martin, who was black. Since the trial, she says her husband treated her like she’s “disposable” and went on a “victory tour” without her. Earlier this month, the two were involved in an altercation at her central Florida home. Since then, she’s been unable to serve him with divorce papers because she doesn’t know where he is. Next Article Smokey Joe’s Café’ A Whirlwind of Musical Bliss! Oooh please, you know that fool profiled Trayvon. It took him not taking you on his “innocent tour” for you to come to this new self revelation? OH PLEASE!!!! Who did not see this coming?? this woman knows darn well her hubby was not innocent from jump street and murdered a young man in cold blood, Zimmerman has a history of abuse , violence, being a pervert and God knows whatever else and now she has her doubts??? I have to wonder if hse was not divorcing George would she admit her doubts about what happened??? probably not!!! So, now that GZ has chucked her the deuces she’s saying she’s “conflicted” on whether he shot and killed TM in self-defense?! This chick needs to drive to the nearest pier and then take a long walk! Unbelievable! For example, Dr. Bao’s repressed evidence of who the aggressor was could provide more cause for federal prosecutors to question whether compelling prosecution argument was nullified. Bush lawyers, for example, claimed the officers violated Rodney King’s civil rights against unreasonable search and seizure because they had used unreasonable force during the arrest. But if Bush had bailed on this case, the detractors would claim that an argument against Rodney’s civil rights could not be made. The American Civil Liberties Union even voted to oppose as unconstitutional the federal civil rights trial of the officers, saying it violates the officers’ right not to be tried twice for the same offence. The fact of the matter is, the federal government can make an argument for a violation of ones civil rights in practically every case, if it wants to. It’s not that Obama lawyers are not smart enough to make an argument against Zimmerman, Obama just won’t allow them to. She was convicted of perjury so it’s difficult to believe anything she has to say. Hopefully Zimmerman gives us a peak into her past. The 3 ring circus is complete. Shellie, those lying defense attorneys, and the naive jury. I didn’t forget the ringmaster George.